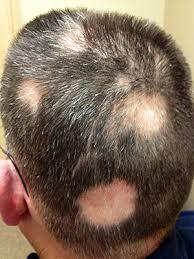 Alopecia Areata also known as Spot Baldness or Hair Loss which is an autoimmune disease. By suffering from Alopecia Areata, Hair is lost from some or all parts of the body. Hair growth had been stopped and hair fall often comes faster than before, usually from the scalp due to the body's system failure. It happens not to recognize its own body cells and destroys its own tissue as if it were an invader. There are numerous hair follicles in all parts of our body and hair growth is possible only by these hair follicles. Alopecia occurs when our immune system get disturbed & started to destroy hair follicles by itself. Often it causes bald spots on the scalp, especially in the first stages. In 1–2% of cases, the condition can spread severely to the entire scalp & other body parts. It occurs also in other species. Baldness or Alopecia is not something which cannot be healed, with proper ayurvedic treatment on get better with satisfied results. Physical appearance is most crucial to believe in him/ her-self when we join any social gathering, parties, jobs, interviews, friend circle and warm moments. To avoid awkward moments, we need to take care of our hair which is really an integral part of our smartness & self-confidence. Alopecia is the general medical term for Spot Baldness or Hair Loss. Alopecia is most common disease in all age group of people children, teenagers, adults, men & women but it's easily curable with ayurvedic treatment in which Mokshak Ayurveda Herbal Therapy Center can help you. Alopecia Areata is an autoimmune condition which causes patches of baldness , patchy hair loss or hair may become thinner. It can result in a single bald patch or extensive patchy hair loss. It is not contagious. There are different types of AA e.g. diffuse alopecia areata, Alopecia areata monolocularis, Alopecia areata multilocularis, Alopecia areata Ophiasis. Total loss of all hair on the scalp is called Alopecia Totalis. Area of hair loss spreads on entire scalp. It is very rare in nature. Alopecia universalis which results in total loss of all hair on the body, including scalp, eyelashes, eyebrows, beard, pubic hair. Area of hair loss spreads on entire body/ epidermis. It is very rare in nature. 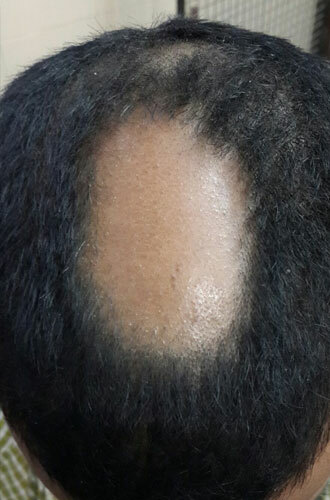 Alopecia barbae is most common in men and hair loss is limited to a beard area. 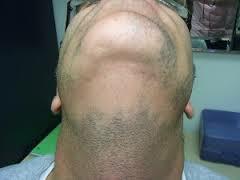 It can be a single bald patch or more extensive hair loss across the whole of the beard area. Androgenetic Alopecia is also most common as Alopecia Areata and baldness found equally in men and women. Hair becomes more thinner to an almost transparent state. 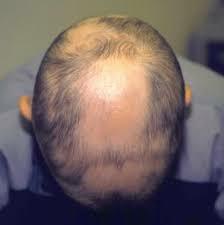 Androgenetic Alopecia is genetic form of Baldness or hair loss. Scarring alopecias, also known as cicatricial alopecias, refers to a group of rare disorders which cause permanent hair loss. 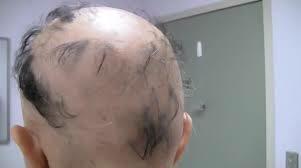 In this type of alopecia, the hair follicle (origin of hair growth) is completely destroyed. Traction alopecia usually occurs due to excessive pulling or tension on hair shafts as a result of certain hair styles. Traction Alopecia is most common in women. Hair loss depends on the way the hair is being pulled. Usually, braids or pony tail are put in too tightly resulting in loss of hair at the hair line. Prolonged traction alopecia can stop new hair follicles developing and lead to permanent hair loss. Anagen Effluvium is generally a hair loss due to various treatments by chemicals, chemotherapy, radiotherapy and immunotherapy used to treat cancer. 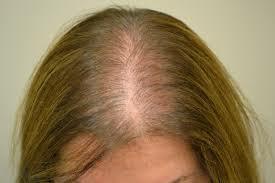 Initially it causes patchy hair loss, which often then becomes total hair loss. 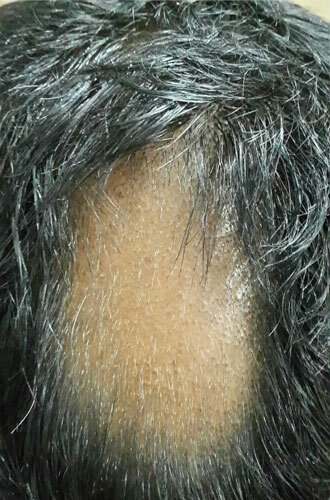 Usually, after few months hair growth starts naturally in most of Anagen Effluvium cases. Other drugs also can cause Baldness or hair loss. Sometimes, Many medicines used to treat even common diseases can cause Baldness or hair loss. Trichotillomania mostly found in children. Trichotillomania is hair loss caused by hair abusing e.g. hair pulling, plucking, twisting or rubbing his or her hair. The hair loss is patchy and characterized by broken hairs of varying length. 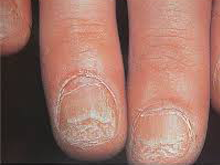 Patches are typically seen on the side of the child's dominant hand. Trichotillomania may be triggered by a stressor or anxiety in your child's life at home such as the loss of a grandparent, birth of a sibling, or a divorce or a school stressor. Hair Abuse e.g. Color, Hair Style, Dryer, Vigorous brushing or Pulling hair, Stiff & Chronic Massage, Irregular Shampoos, Hot Water etc. Alopecia is not a curse and it is curable. it is not painful, it does not make you feel sick, and it does not result in serious health problems. You cannot spread it to other people. Alopecia is not contagious. Alopecia can be challenging up to some extant who have the disease and for their families. Although Alopecia impact people socially, emotionally & psychologically, there are some common experiences among who are suffering with the same. Leading main symptoms of Alopecia are small, coin size, round, smooth, bald patches occurring more or one side of the scalp. Sudden hair loss may occur on the scalp and other parts of the body. Sometimes hair fall is highly unpredictable and random. You may first notice clumps of hair on your pillow, towel, comb or in the shower. The underlying skin is unscarred and looks superficially normal. 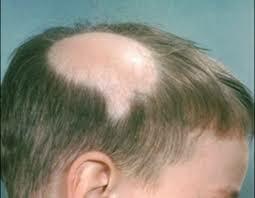 Bald patches can take many shapes & structures, but are most usually round or oval. Exclamation point hairs, narrower along the length of the strand closer to the base, producing a characteristic "exclamation point" appearance, are often present. Hair loss alone shouldn’t be used to diagnose alopecia areata so diagnose might be followed by some kind of pathological/ health tests. Hair usually grows back within few months or a year & the extent of hair loss and re-growth varies from person-to-person; you may decide not to treat alopecia. If you choose not to treat the condition and wait for your hair to grow back, you may wish to by wearing hair wig & with the help of certain hair care products or style techniques. It also found in some cases that long-term ignorance of Alopecia becomes quite complicated during therapy treatment. In Modern Science- Hair loss alone shouldn’t be used to diagnose alopecia so diagnose might be followed by some kind of pathological/ health tests. Alopecia is diagnosed through a family and medical history and physical examination. Often, Doctor asks questions about patient hair loss, look at the pattern of hair loss, and examine scalp. A few hairs might be tugged gently by doctor for making scientific opinion. If the reason for hair loss is not clear, Doctor may go for hair analysis test to check for a disease that could be causing hair loss. It includes sample of hair & examine the same medically. A scalp or epidermis sample might be taken sometime. Some pathological body test might be referred by doctors. A biopsy is rarely needed to diagnose Alopecia. 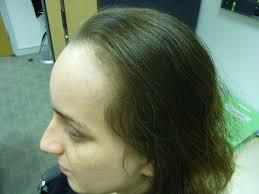 Oral Medication- First & most applied therapy is medication after identifying the cause of Alopecia. Medication depends upon the type of complications due to deficiency of nutrition, thyroid or other Endocrine problems, hormonal changes, extreme stress or severe injury or high fever etc. .
Topical Corticosteroids- This treatment is quite painful because corticosteroids/ steroid (clobetasol or fluocinonide) injected into the scalp about 1cm. at the time duration of 3 to 6 weeks. Sometimes steroid cream also used depends upon the nature of illness, however is not as effective and it takes longer in order to see results . Composite Medication- Some times finasteride / Minoxidil (Rogaine)/ Elocon (mometasone)/ irritants (anthralin or topical coal tar) may be used along with topical corticosteroids injections or cream or ointment to the affected skin. It doesn’t work for every person & it is too expensive. It may affect your health adversely. 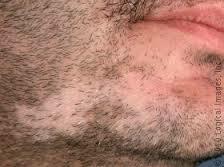 Topical Immunotherapy- This treatment also known as International Allergic Reaction. Under Contact Immunotherapy Triggers, a medicine (Cyclosporine) is tinted on the scalp once a week. Usually, this irritates the skin and makes it red and scaly and swollen lymph nodes. PUVA Therapy- Psoralen with ultraviolet A light (PUVA) therapy usually is reserved for people who have large areas of skin affected by alopecia areata. This treatment consist few process of Psoralen medication & UVA Light. Hair Transplant- It is quite more painful & long-term & time consuming process as well it is quite costly. Surgeon treats many times different areas by stripping the scalp. Surgeon cleans and numbs the area where the hair will go, creates holes or slits with a scalpel or needle, and delicately places each graft in one of the holes. Biologics Therapy- One group of drugs being tested are "biologics," which have bits of protein that interfere in a very specific way with the activity of immune cells. Biologics are injected systemically to damp down the immune activity and allow hair to re-grow. The results of these trials are awaited with much interest. Acupuncture- Acupuncture is a component of the health care system of China that can be traced back at least 2,500 years. The general theory of acupuncture is based on the premise that there are patterns of energy flow (Qi) through the body that are essential for health. Acupuncture is a family of procedures involving stimulation of anatomical locations on or in the skin by a variety of techniques. Ayurveda originated in India over 6000 years ago, known as The Science of Life. Ayurveda is self explanatory, “Ayu” means Life & “Veda” means Science. Rig-Veda is one of the most ancient Vedas created by Hindu Spiritual Personalities (Rishi, Muni & Saints) which contains numerous kinds of Ayurveda fundamentals & prescriptions for different types of diseases. Ayurveda is the traditional way to cure the ailments by blends of different kind of herbs, plants, seeds, flowers, oils, stems, roots & extracts etc. as well some metal ashes are also used. 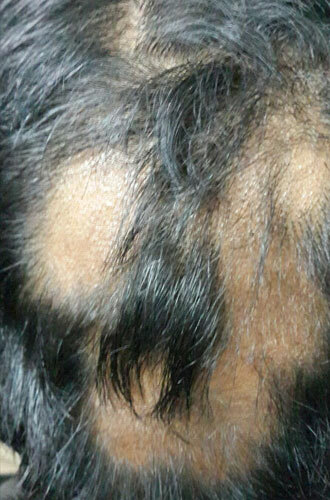 Alopecia Areata has been described as Indralupt, Khalithyam, Ruhyam in Ayurveda. Indralupt can be correlated to Alopecia Areata (Ring shaped hair loss). Khalithyam is the general hair fall as a long continuous process and Ruhya is a hair loss condition which affects the entire body. Doshas (Vata, Pitta, Kapha) simply describes energy levels of our body. When any of them, accumulate in the body beyond the desirable limit, the body loses its balance. Human body gets diseased due to the occurrence of such misbalance. In context of Ayurveda, Imbalanced form of Dosha is one foremost reason for hair loss. When anyone with an imbalance in Dosha (Vata, Kapha, Pitta), is more prone to hair loss. It is essentially excesses in either vata or pitta doshas that can cause hair loss. The hair follicles will then fill with blood or kapha, inhibiting re-growth. 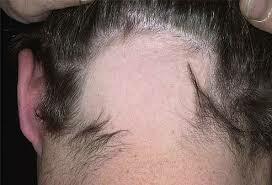 Excess pitta can cause premature grey hair, and excess kapha and vata can cause dry and brittle hair and an itchy scalp. Vata dosha is mainly responsible for movement and transportation of food nutrients through the empty channels and spaces of the body. Excessive or imbalanced Vata dosha can result in hair loss or scalp baldness, damage hair follicles, leading to dry scalp, dry hair, split ends, and finally, thin hair or hair loss. Alopecia Areata is an auto immune disease which exact medical cause is not known till the time or its idiopathic (No reason found) and No therapy can guarantee that a patient will remain symptom free for the rest of the life. However, Mokshak Ayurveda or Herbal Treatment is most reliable & herbal therapy is quite long lasting. 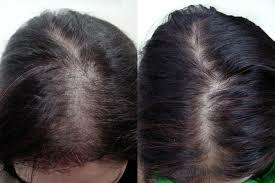 For Alopecia ayurvedic treatment we use 100% herbal oils & paste which are most effective for the re-growth of hairs. 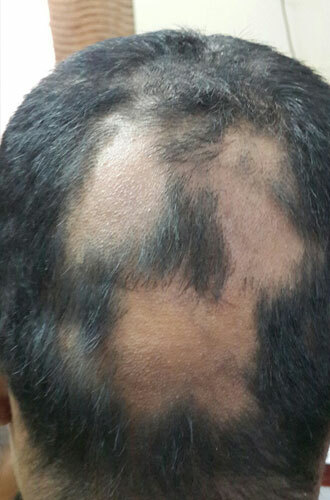 We observed in many of cases that results found within few months with lowest rate of recurrence of Alopecia Areata. There are no adverse effects during the herbal treatment. It’s not such kind of disease which spread from one to another. Mokshak Ayurveda or Herbal Treatments success ratio is higher than other treatments in terms of cost, time, convenience & long-lasting effects. We have seen most cases in our clinical practices that re-growth of hairs may start with soft white or creamy or dull and thin hairs but eventually that hair texture and pigment becomes natural or black after some time. Mokshak Ayurveda or Herbal Treatment is safe during pregnancy as well dietary supplements, multivitamins, Allopathic or homeopathic treatment may be continuing as per the wish of patient. We don’t recommend any kind of oral pills or smelling ointments or injections. We use only herbal oils & creams for Alopecia Areata patient which applications are quite convenient & appreciating. The prognosis for Alopecia Areata is complex. Symptoms or cure time varies person to person. We suggest to all such patient to live positive & to be passionate during the treatment. No patient should assume rapid results because any therapy (Modern or Traditional) takes minimum 2 to 6 months to be cure even it also depends upon the chronic level of disease. Alopecia totalis & Alopecia Universalis is more complex than patchy Alopecia or baldness of hair loss. Alopecia totalis & Alopecia Universalis known as the extreme stage of Alopecia, accordingly it takes quite more time to be cure around 2 to 4 years.